While the mainstream media focused and amplified the message of the March For Our Lives protest and the student walkouts led by David Hogg to attack the God-given rights of Americans, they largely ignored students from several states across the nation who protested Planned Parenthood and the murder of the unborn. 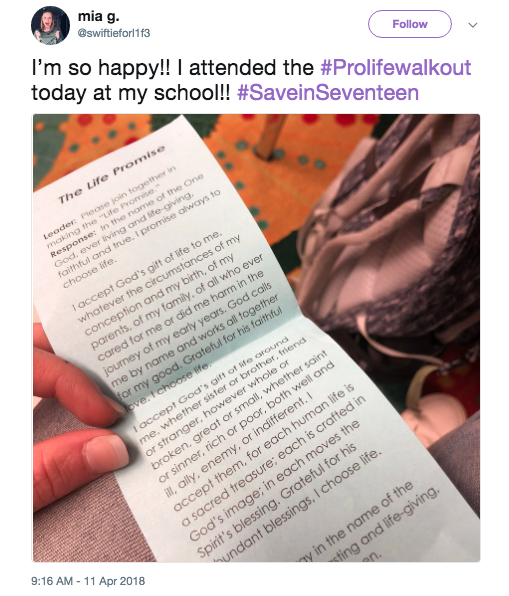 The walkout was organized by Students for Life of America. On Wednesday, April 11th, we will walk out of our classes for 17 minutes of silence and prayer. We will stand silently outside outside honoring the 10 children who will violently die during that time at a Planned Parenthood abortion facility … We will kneel and pray for the end of legal abortion in our nation. This seems to be a serious Pro-Life group that does not have its goal set on merely regulating abortion as many pro-life politicians have been doing for decades, but abolishing it. “We are the Pro-Life Generation and we will abolish abortion,” is the group’s slogan. The group is a 501 non-profit organization that seeks to end abortion, euthanasia, and infanticide by educating students on these issues and calling them to action. The website for the walkout listed high schools and colleges where students participated, including private schools. So, how did it all turn out? Take a look at these pictures from the walk out. Furthermore, it seems apparent that these students recognize the Creator in the midst of it all and that life is something precious that is not only a fundamental right, but something taht should be fought for. All did not go without those who wanted to, in large part, silence some of the students. Rocklin High School student Brandon Gillespie suggested holding a walkout to protest abortion and to highlight the double standard. As noted at Life News, mainstream media coverage of the protests was minimal in contrast with the anti-gun student march held last month. Some students also claimed they were suppressed by school principals who tried to talk them out of holding walkouts. The Sacramento Bee reports students at Gillespie’s high school were not disciplined for holding the walkout. Good for them. At a time when Millenials are being mocked and put down, I’m glad to see that there is still a remnant of young people who are standing for the right things in our land. May God richly bless their efforts and may we see full and true repentance of the murder of the unborn and abolish abortion in our lifetimes. God help us! Praise God and thank you students. You have a voice and it was hears and is being heard – sadly not by the media news. Agreed, yet we continue to try!